Clifton dentist Wayne Gangi is known for his extravagant, gory, over-the-top Grove Street Halloween decorations every year. 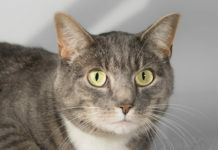 He’s also a fan of Christmas lights, covering every square inch of his property with them. 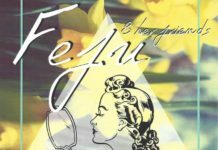 This week, Gangi created a new display featuring five mannequins dressed provocatively in lingerie, fishnets, thigh high stockings and bunny ears, holding Easter baskets. (The mannequins had first appeared on Gangi’s lawn last month, clothed in green for St. Patrick’s Day). Offended by the risqué display, one woman took it upon herself to take it down. The controversy caught the eye of Inside Edition; watch the video here. Gangi, who told Inside Edition he’s surprised by the backlash because “women suggested he set up the display” had yet to bring back the mannequins Wednesday morning. 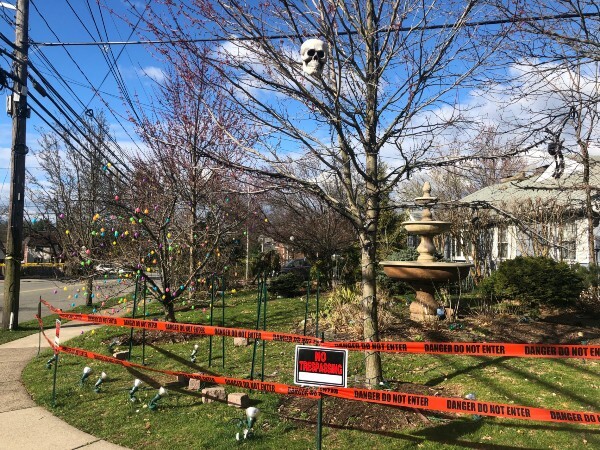 The scene outside his home sends a message — a tree of colorful Easter eggs along with an ominous skull, “Do Not Trespass” signs and “Danger Do Not Enter” red tape. It’s stupid, tacky, and meh. But I am offended by the person who took it upon themself to go on the property and take it down.